The Zombie Apocalypse Trilogy Kindle Box set is now available! Receive all three kindle books for only $9.99! Click here to download now! 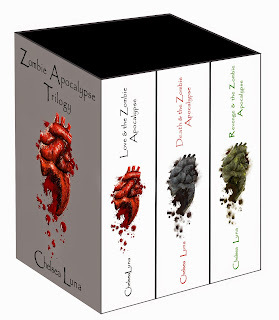 This boxed set includes all four books in Chelsea Luna’s BESTSELLING young adult Zombie Apocalypse trilogy – Love & the Zombie Apocalypse (Book 1), Death & the Zombie Apocalypse (Book 2) and Revenge & the Zombie Apocalypse (Book 3). Three books for the incredible low price of $9.99.